This text offers state of the art contributions written by world renown experts which provide an extensive background on specific classes of antibiotics and summarize our understanding as to how these antibiotics might be optimally used in a clinical situation. 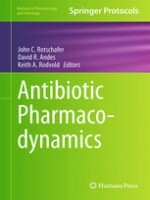 The book explores pharmacodynamics methods for anti-infective agents, pharmacodynamics of antibacterial agents and non-antibacterial agents, as well as pharmacodynamic considerations and special populations. As part of the Methods in Pharmacology and Toxicology series, chapters include detailed insight and practical information for the lab. Comprehensive and cutting-edge, Antibiotic Pharmacodynamics serves as an ideal reference for scientists investigating advances in antibiotic pharmacodynamics now finding their way into the antibiotic development process used for licensing new antibiotics.